Yesterday, as I was contemplating what to cook for my family this weekend, this roasted radish salad came to be. My kids love potatoes no matter how you prepare them, but potatoes are fairly high in calories and quite starchy. I considered how I could make a dish that used potatoes as a key ingredient a bit healthier. As I searched for inspiration, the idea of making the same potato recipe I usually make when roasting potatoes, but substituting a healthier ingredient for the potatoes. Radishes came to mind. Radishes are a spring vegetable and filled with vitamin C—a great vitamin for rebuilding tissue and keeping bones and teeth strong and healthy. One medium-sized radish supplies only one calorie compared to a medium-sized potato’s 160 calories. 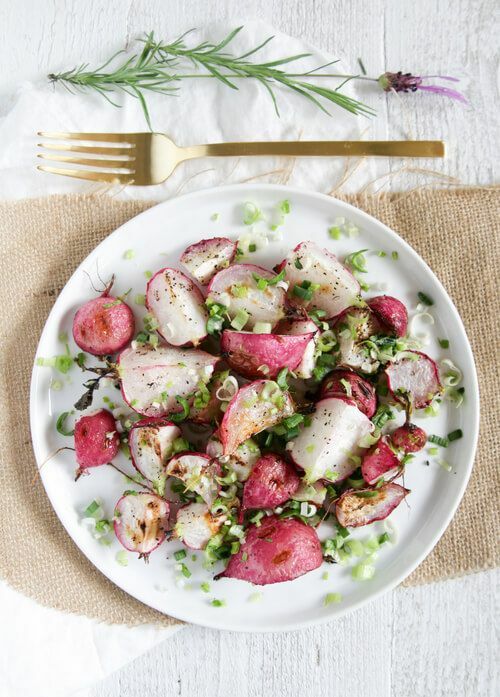 Of course radishes taste different from potatoes, but different can be good—especially when it is a healthier alternative that tastes great roasted. Toss radish with olive oil, salt and pepper.